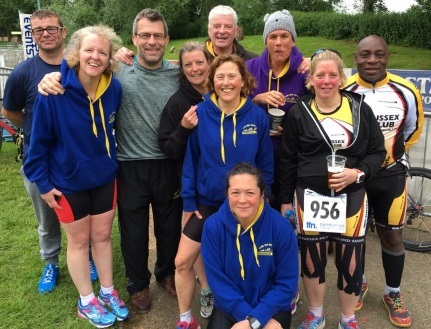 On Saturday 1st September eight members competed in the 5km River Adur swim. 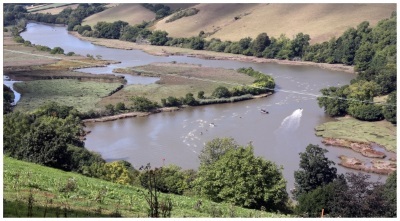 This race starts opposite the Old Shoreham Cement works with competitors swimming with the outgoing tide and finishing at the Adur centre, next to the A259 roadbridge. A few sandbanks have to be avoided along the course. Barry Davids finished in a very commendable first place in the fin swim in 1.06.41. Steve Mcmenamin was first club member to finish in standard swim in 1.17.30, followed by David Ricketts in 1.21.33 just ahead of Gareth Handley in 1.21.35. Liane Davids was first female club member to finish in 1.25.28 followed closely by Merrin Forbes in 1.27.09, Kay Mcmenamin in 1.27.36 and Sharon Chaldek in 1.36.32. I should start by saying that the Outdoor Swimming Society doesn't market the Dart 10k as a race and I'm sure this fact really adds to the festival atmosphere of the event. That said; A measured course, Timing chips and 4 waves of differing ability (Leisurely, Medium, Fast and Elite) have all the elements necessary for good competition. Add to that the fast flowing tidal waters of the river make for a potentially fast time. 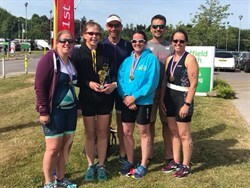 It is run from Totnes to Dittisham through the very picturesque rolling Devon countryside making it one of those must do events amongst distance swimmers. I entered back in February amid the scramble for places, 800 slots selling out in 45 minutes! 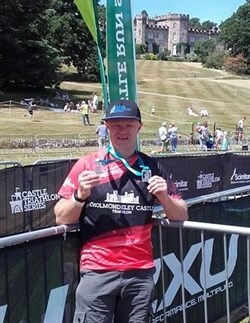 Having completed the swim in 2012, I had a good idea of what to expect, but 2 years is a long time to remember the geography required for good navigation. So the day before race day I dragged my family on to the Totness - Dartmouth ferry, packed with lots of other swimmers nervously clutching maps and route info, for a recce of the course. Taking the slow ferry down the river made me realise that both ignorance can be bliss and 10k is a long way. But it did help to locate where the feed stations should be, having missed one last time round I didn't want to make the same mistake twice, nor did I want to repeat my wasted effort of swimming up dead end creeks. With registration also available the day before all was set for a relaxed evening and smooth morning. So to race morning, up early, big bowl of porridge with honey, check my bag for wetsuit, tri suit to go under for added warmth (11 degrees C last time! ), hat, goggles, gels, water, bananas, glide, warm clothes for the other end and I was all set. I blagged a lift from the B&B with some fellow swimmers I'd reconnected with from last time so Jo and the kids could make their way to the finish in their own time. Down at race HQ, all we had to do was collect timing chips and be ready for our wave briefing. I had chosen to go in the most popular Medium wave, but it really makes little difference as everyone follows the same path and crosses the timing mats immediately before entry into the river. Though my plan to be at the front of the wave to minimise overtaking was scuppered by chatting too much and I soon found myself at the very back. Good job the river is wide! Water clarity at the start was never going to be good with the brackish run off from Dartmoor but at least it was a warmish 17 degrees C. No time for my usual warm up routine, straight into a steady stroke. The first stretch of the river is fairly straight with one important instruction to keep to the right so as to avoid oncoming traffic of the boat variety. I set a course to the centre of the river and set about over hauling those ahead. It didn't feel too long before I could see the first feed station. I swam up to the platform and braced myself against the flow. Fished out a gel from up my wet suit sleeve and took on some water (bottled). I took a sneaky look at my watch as I pushed off, I was 54 minutes in. This got my brain working as I tried to predict my finish time. First feed station was published as being at 4k. It took me a while, but calculated this to be 13.30 minutes per Kilometre, 135 minutes for 10k or 2hrs 15. Not possible. I soon realised the feed station was in the same place as last time and that was said to be at 3k and there was no way I was swimming that fast, flow assisted or otherwise. I promised myself no more time check till the finish. The next two kilometres see the river flow through quite wide meanders, requiring good sighting and positioning to get the best route. This is also one of the most beautiful sections with steep wooded sides to the valley. After this the river opens out into the most exposed section where it is up to 1km wide. This presents a few new challenges, for the first time it becomes quite possible to swim up a creek if you're not careful, also some sections of the river are very shallow and the amount of silt churned up can create a total brown out. I touched the bottom a few times with my hands and had to modify my pull stroke to pass closer to my body. And lastly wind blowing against the flow created quite a big chop. Waves of 12 to 18 inches making for interesting experiences, on more than one occasion I found my upper body completely out of the water as I crashed through. This did test my bilateral breathing as you couldn't rely on getting a clear breath in. 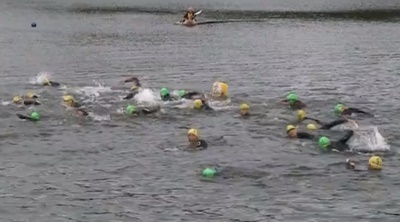 At about this point the first of the Fast and Elite wave swimmers started to pass me. I found the second feed station and took the opportunity to take on my second gel and a few glugs of water. Not wanting to hang around too long I pushed the empty wrapper back up my sleeve and kicked on. It is amazing what a 30 second breather and a burst of sugar and caffeine will do. I was feeling in good shape. True to my promise, no clock watching but I knew I still had between 2 and 3 km's to go. The route takes a final right hand turn, through 90 degrees with about 500 metres to the village of Dittisham. On seeing what I thought was the turn point ahead I decided to push hard for the finish and maximise my chances of a PB. You guessed it, it turned out to be another creek. I have to admit to a moment of panic, not knowing how much further it was and suffering self-inflicted oxygen debt. A little self-reasoning and I realised I couldn't be much more than 500 metres short. One stretch of the reservoir loop. No problem. At the real turn you find yourself swimming past the moored pleasure boats and get a real sense of the 'run in', spectators line the shore for the first time and you can see the marquees and catering stalls on the Ham. I even spotted my daughter and gave her a big wave, must be something about my style as she had already picked me out. It was fantastic to be greeted at the finish by my family, my 74 year old Dad even ran back to the car to pick a pair of flip flops for me to ease the stony walk up to the field. Hot tea in a commemorative mug, medal and event photos were waiting. It was a great village fate like atmosphere with local produce stalls, Ukulele band, art exhibitions, Lamb roast, burgers, cheese and cakes of all shapes and sizes. Just what you need to refuel for the five hour drive home. As to my time, I clocked a PB of 2 hours 34 minutes and 19 seconds. 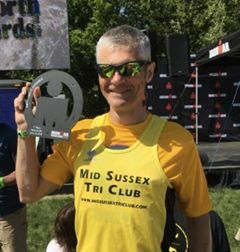 A big thanks to everyone who gave me a confidence boost when my training plan was knock off course on Lindfield High Street. You really can do quite a bit more than you think. 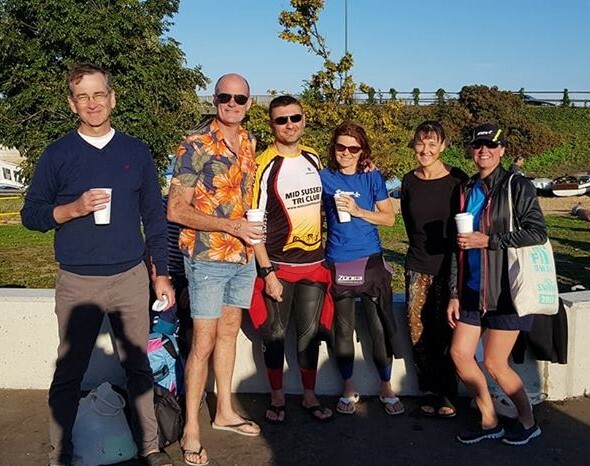 The 5-3-1 charity swim was a great success with several participants completing all the distances on offer to swim a whopping 9km! Early reports indicate the event has raised over £1000 for the Lauren's Silver Swimmers charity. Louise and Stuart Silverlock were most grateful and sent the following letter through to Mark Jordan. 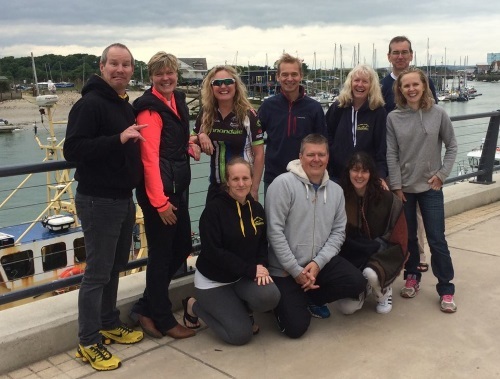 We wanted to write and thank you for organising the open water swim at Ardingly on 2nd August 2014 in aid of Lauren's Silver Swimmers. It was an extremely emotional day for us as it brings to the forefront again the loss we have to go through on a daily basis. Although the charity was something we wanted to achieve, it is still immensely hard to put into words how we struggle on a daily basis. I would be grateful if you could forward this letter to everyone involved with the day along with our sincere thanks for the kindness shown to both myself and Stuart. It highlights in more detail the aim of the charity which I found somewhat difficult to convey yesterday. As you know, we lost our daughter Lauren in December 2012 aged just 9. Lauren was born at 24 weeks and spent the first 6 months of her life in many hospitals around the country. As a result of her extreme prematurity Lauren was diagnosed with Cerebral Palsy. Lauren was a fighter from birth and seemed to take great pride in proving all the medics wrong. We were told of many things Lauren would be unlikely to achieve, although what they didn't realise was her great strength and personality that would prove everyone wrong. Lauren achieved everything in her short life and much much more. When Lauren was a year old she was given Aquatic Hydrotherapy treatment which was to prove invaluable to her overall wellbeing and body strength. However this treatment was given to her for only 6 weeks, having one half hour session each week. It was then up to us, as her family, whether we were able to continue to provide Lauren with further treatment, of which there was no question. The treatment in the water has outstanding results, allowing children like Lauren to achieve their full potential. This treatment however is expensive, costing in excess of £45.00 for a half hour session. Of course we did our best as a family to ensure she received this treatment weekly as it was clear that the benefits were huge. Lauren enjoyed her sessions and it gave her an experience that most children take for granted, swimming. 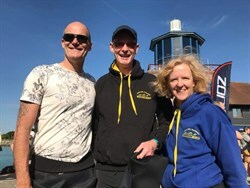 The focus of the charity is to be able to subsidise the cost of Aquatic therapy for children that would benefit from regular and constant treatment. Our long term dream is to build 'Lauren's dream', an aquatic pool available for all. With the generous support of people like you and all of those involved with the swim, we will be able to help many of these children. The generosity of everyone yesterday, giving their time to take part in this event, is something we will never forget. I know the final figures haven't been calculated as yet but the amount that has been indicated to us is truly amazing and it is thanks to people like yourself, dedicating so much time and effort in organising the event, that will enable us to continue to work towards 'Lauren's Dream. Thank you to everyone that was involved in the day, the organisers, the people in the safety boat and canoes, the people on the side ensuring no-one skipped a circuit! !, and to all those that entered the water and swam for so long. I really am humbled at what I witnessed yesterday and feel thank you is not enough to show how much we appreciated you all giving your time for our charity. For more information on our charity and upcoming events please email me lasilverlock@yahoo.co.uk .